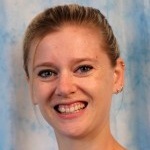 Ellen A. Cappo is a Ph.D. student in the Robotics Institute at Carnegie Mellon University in Pittsburgh, Pennsylvania, working with Nathan Michael. She received her S.B. degree in Mechanical Engineering from the Massachusetts Institute of Technology in 2007 and her S.M. from the Robotics Institute at Carnegie Mellon University 2014. Her research focuses on online planning and control of multi-robot systems.